I decorated A Teddy Bear Tea for some of our volunteers to be able to sit at and enjoy tea after hours of food preparation and serving. I used various tea-themed Teddy Bears from my collection and a pink boa gathered as the centerpiece. The china is actually Johnson Brothers everyday dishes made in England. I picked up the vintage pink napkins at an antique shop in Cookeville, TN several years ago. The chairs are draped with pink and white boas. I wanted to show our hostesses and guests a whimsical and practical theme they could share with children. Very cute and I am sure the girls loved it. I wondered if this would be best for little girls with all the pink going with those bears. Tea-themed teddy bears? This little boy wants to be a part of that too. How fun. I love all the bears! 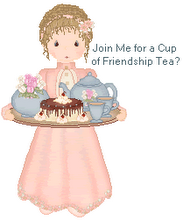 I am so glad you had a table for the volunteers, they are an important part in any tea.